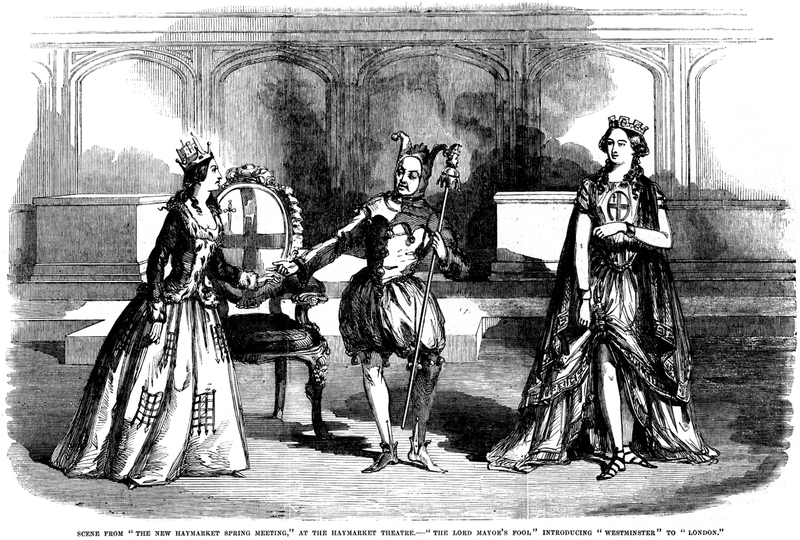 Scene from The New Haymarket Spring Meeting, at The Haymarket Theatre.--The Lord Mayor's Fool Introducing Westminster to London. The accompanying illustration represents the meeting of London and Westminster and the interposition of the Fool giving the moral of the scene. The portraits of Mrs. Caroline White, Miss Harriett Gordon, and Mr. Buckstone, lend an interest to the picture. The matter of complaint against the City is that within its walls it fails to encourage the stage and that people must go as far as Norton Folgate for a theatre. This civic prejudice is old enough to be obsolete, and the rejection of the drama, so that it has to find refuge in extramural establishments, is anything but creditable to the intelligence of the authorities. The City of London ought, as a duty, to have a model theatre for the high drama, and might do much good in this way and find beneficial occupation for funds now wasted. The attention bestowed by the Haymarket manager on the National Standard and its neighbour theatre speaks much in favour of his liberality. There the drama is at present flourishing in its severer forms, and it is to the metropolitan Orient that we must look for promising indications of a new era. Westminster, on the other hand, has an advantage in its various exhibitions, some of which are of a highly original character and others so unique that they secure a long run without fear of competition.